The photo shows the old cinema in Swords. It was located on Main Street where the Penneys shop is at the moment. This cinema was owned by Tom Bray. It closed down in 1968 but the building stood empty for another twenty years and was demolished in 1986. 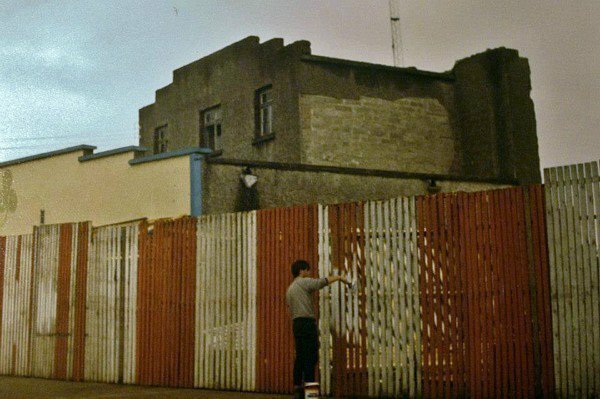 The cinema site and some cottages to the right became the home of the new Superquinn shop which opened in 1988. When Tom Bray owned the cinema he also had a small grocery shop to the right of the building. As far as I can remember the admission price to the cinema was six old pence, or if you were stuck for a few bob Tom would except Jam Jars or lemonade bottles as payment. Back in the 1950's and 60's it was common for shop keepers to pay for the return of certain glass bottles and jars. Most cinemas in Ireland at the time were nick named ''Flee Houses'' and this one was no different. Hector Brey owned a Bubble Car which he parked outside the shop, sometimes with no hand brake engaged and the ''Bold Boys'' would push the car out onto the street for the craic. [ not me ]. When the films were showing and couples were smooching in the back rows the lady usher would call their names out loud to embarrass them into stopping whatever they were doing. When the shop closed down the building lay empty for years later. The large doorway was a magnet for courting couples or those shetering from the rain waiting for the bus. [ No Bus Shelters Back Then] It was knocked down along with about 4 other houses to the right of where Penneys are. Two years later a brand new Superquinn opened. When the Pavilions opened Superquinn hesitated before making the move over as they were doing very well in the old shop.